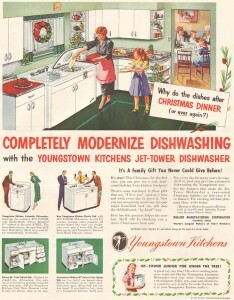 Women have undoubtedly found liberation through the technological advances of the kitchen. Technology, tools and the mass production of foodstuffs have freed American women from the vast majority of the laborious and time-consuming tasks associated with cooking for and feeding a family. 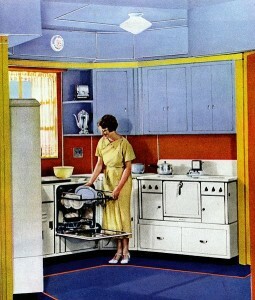 Also, the kitchen, as well as the domestic space in its entirety, has become a place of personal expression for women. Acquiring modern technology in the kitchen, as well decorating and filling it with material goods, is a way for women to exhibit the financial and cultural success the have achieved. Most American women fulfill roles in both the public and private spheres. Despite the fact that most women have joined the public workforce, it has been difficult for us to shake our role as primary domestic caretaker; homemaking tasks still fall primarily on the woman’s lap, which means we need to both complete our paid work and our unpaid domestic duties. 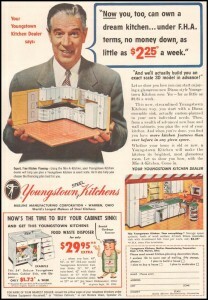 The modern kitchen can be representative of this dual role. In one sense, we are still tied to the home and the domestic, but the kitchen no longer has to be a source of oppression or subjugation. Technology has played a huge role in freeing women from the drudgery of the kitchen; it has essentially served as an agent of freedom. New technological tools and kitchen gadgets have been invented to help women complete domestic duties. Because of major inventions like the electric stove, the slow cooker, and a wide variety of packaged food goods, preparing meals is much simpler and easier. Women no longer need to spend as much time in the kitchen cooking meals or preparing foods. These technological advances have allowed women more free time for other activities, such as working outside the home or simply engaging in leisure activities. Food tasks have been made simpler and more accessible by these technological advances. The knowledge of foodstuffs women traditionally possess is less imperative to domesticity, thus releasing the domestic duties to other members of the family. As technology progresses, it becomes easier to navigate the kitchenspace. Now, each member of the family can successfully prepare a meal for his or her self without the assistance of the mother or wife. This has becomes more necessary, as many women have taken jobs outside of the home, which leaves little time to prepare foodstuffs and meals. Besides the liberation of these technological advances, the acquisition of the technology in itself serves as a means of empowerment. Women can use the kitchen to express personal success and achievement. 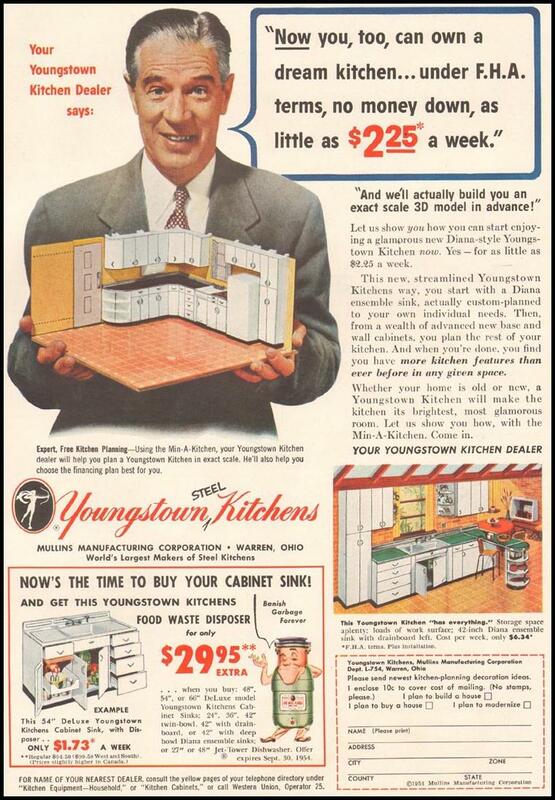 In America, achievement is best displayed through the material, and in the kitchen this means technological acquisitions: the high tech stove, the stainless steel appliances, the expensive breadmaker. They all represent achievement through personal, material success. Because of our unshakable ties to the domestic space, women have the unique ability to transform the space to reflect our selves, our personal tastes and our achievements. Our homes become display cases and tangible personal statements. 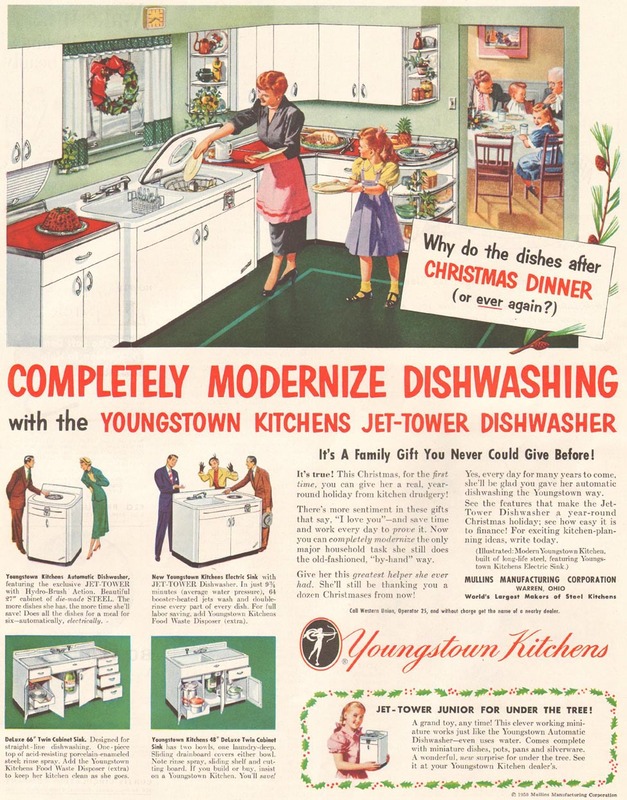 In Kristin Jacobson’s article “Renovating The American Woman’s Home: American Domesticity in Extreme Makeover: Home Edition“, she conveys that in contemporary American culture, acquisition of technology and material goods can provide us with a sense of achievement. This pertains especially to the home, a place that is in and of itself a symbol of our success and realization of the American dream. Because women are so closely tied to the domestic, this principal is particularly relevant to the feminist movement and ideology. The home can serve as a space of recognition and empowerment for women through the attainment and acquisition of technology and materials that can make her domestic life both more aesthetically pleasing and efficient.